As more and more small businesses adopt cloud computing, demand for optical systems and components will increase significantly in the near term. Indeed, surging demand for both high-speed data transmission, storage of large amounts of data, and scalability and cost effectiveness of Cloud systems across various application segments is already driving tremendous growth in this market. 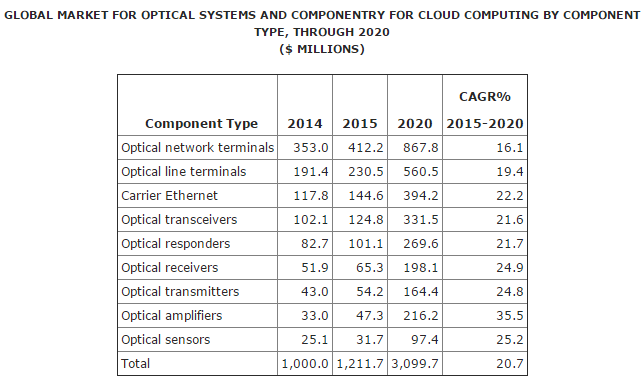 According to BCC Research’s Optical Components and Systems for Cloud Computing (PHO020), the market for Cloud optical systems and componentry is expected to reach $1.2 billion in 2015 and nearly $3.1 billion by 2020, reflecting a tremendous five-year compound annual growth rate (CAGR) of 20.7%. By system, passive optical networks (PON) hold the largest market share in the optical systems and componentry market for Cloud computing. The PON segment held a market share of 54.4% in 2014 and is expected to hold the position of market leader through 2020. Programmable logic controllers held the largest market share in the optical systems and componentry – 42.2% -- market by software control systems in 2014 and is expected to hold the position of market leader through 2020. Optical network terminals held the largest market share in terms of componentry. This segment held a market share of 35.3% in 2014 and is expected to hold the position of market leader for the foreseeable future. The optical systems and componentry market for Cloud computing has applications across various industry segments including healthcare, logistics and warehousing, information technology, entertainment, and personal use, among others. With Cloud computing being heralded as the latest driver of high-tech innovation, the optical systems and componentry market for this sector is expected to experience robust growth over the next five years . Further, the usage of Cloud computing is expected to increase considerably as small businesses move to the Cloud in an effort to balance between their need to transfer some services to the Cloud and manage some of them in-house. Passive optical networks (PON) provide high scalability, reliability, ease of use, energy savings, environmental sustainability, optimized bandwidth connectivity, advanced security, and the lowest total cost of ownership. Copper wire in the traditional network emits electromagnetic radiation; so any device near the network can easily capture the emitted radiation, and the transmitted information or data can be lost or stolen. With a PON, optical fibers made of dielectric material are used, thus, no electromagnetic radiation is produced and no information or data can be lost or stolen. Further, PONs provide easier installation and maintenance than traditional networks, which simplifies operations. Indeed, ease of upgrading is one of the benefits of a passive optical network. The use of PON minimizes the network’s downtime during upgrading and expansion, as existing fiber-optic cable remains in place and only the electronics are replaced, rather than the entire infrastructure. The components required by a passive optical network are wide-area network (WAN) routers, Ethernet aggregation switches (EAS), core routers/switches, work group terminals (WGTs), and the fiber and passive optical splitters. PON lends itself to central management and, owing to its built-in capabilities, the network never encounters multiwired, chaotic closets. PONs also require limited active connections and devices to support. Therefore, upgrading a PON means upgrading a single accumulation switch, rather than upgrading multiple switches from building to building. In spite of the substantial benefits of PON, the major challenges faced by the network operators are high installation costs -- primarily driven by high component cost at the optical interface side. Consequently, there is high initial investment involved at the service provider’s end, which can slow down the growth of the PON equipment market. However, the equipment cost is very low when compared with other costs, as the components required at the service provider’s end are less complex and technologically advanced. The capital expenditure is the highest as the setup at the subscriber’s end is complex and requires a high amount of technological expertise and investment. On the other hand, fiber trenching requires a considerable investment as compared to the equipment cost, contributing to high capital expenditures. Thus, although there are a number of investments involved, cost recovery is possible. According to Full Services Access Network, the next generation PON technologies will be developed and launched in two phases: XG-PON and NG-PON, which will deliver higher upstream and downstream speeds. NG-PON and XG-PON are expected to contribute to the evolutionary growth of existing passive optical networks. Furthermore, XG-PON will coexist with the current fiber structure of PON, which means no further cost would be incurred in deployment of the new advanced technology. NG-PON would increase transmission speed up to 40Gbps, increasing the reach and capacity of the system. These innovative solutions are expected to offer great opportunities for the PON market, owing to the increasing need for connectivity devices leveraging existing infrastructure and minimizing additional cost for deployment.